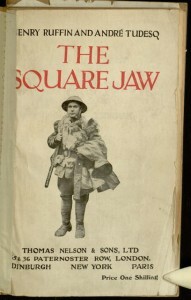 The latest completed title out of Distributed Proofreaders is Henry Ruffin and André Tudesq’s The Square Jaw, a collection of articles written by the two French war correspondents during the first World War and translated into English for this collection. Since these were reported as events were happening, and because they were aimed at the French public, the tone of these writings differs in some ways from many other accounts of the conflict. While many of the usual horrors are on display, the tone of the pieces has a certain underlying optimism — clearly intended to boost morale — and there is a very strong focus on the friendship between France and Britain and the honor of British troops. Specific details about times and places are often intentionally excluded, though there are some thorough accounts of the fates of certain small French country towns. 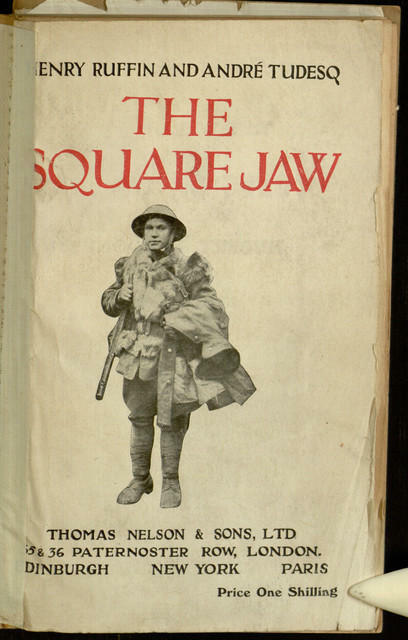 While this book certainly doesn’t give the modern reader a thorough perspective on the conflict, it is an interesting glimpse into what some of the people most affected by the war may have been reading while it was going on around them. The full text can be read online or downloaded through Project Gutenberg.